Torklift International partners with Outdoors RV Manufacturing to create upgraded additions to go on their latest travel trailer, the 2017 Black Rock. Designed to be an off-the-grid travel trailer that is meant to be lived in for weeks at a time, the Black Rock trailer is great for preppers, hunting and outdoor enthusiasts who love to camp for long periods of time without having to leave their spots to get more supplies. Together with their specifications and our manufacturing, Torklift and Outdoors RV Manufacturing has designed four upgrades to go on the 2017 Black Rock trailer: the Off-Grid Battery Tray, Off-Grid Receiver Hitch, specially designed Lock and Load SideKick and Space Dock. All products listed on this page are engineered and designed exclusively for Outdoors RV Manufacturing by Torklift International, comes with a Legendary Lifetime Warranty and is proudly made in the USA. 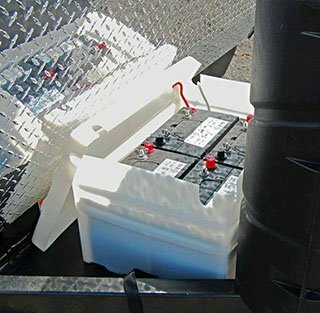 The Outdoors Manufacturing Off-Grid Battery Tray is designed to securely attach to the A-frame of the 2017 Black Rock travel trailer for extra battery storage. The Off-Grid Battery Tray is screwed into their trailer’s A-frame and comes as standard equipment from Outdoors RV Manufacturing on all off-the-grid Black Rock trailers. 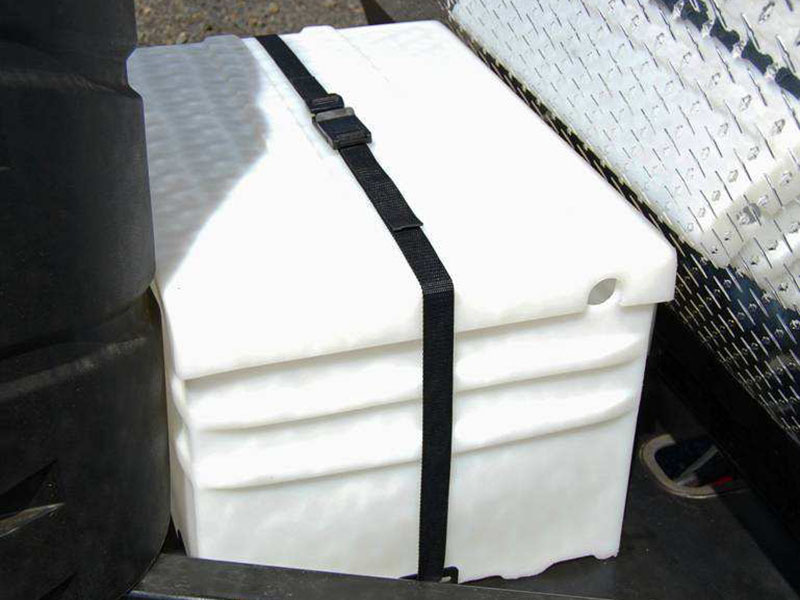 This trailer battery tray is specially manufactured to include tabs that protrude from the tray that make it simple to attach straps to secure and lock down up to two additional batteries for your trailer. 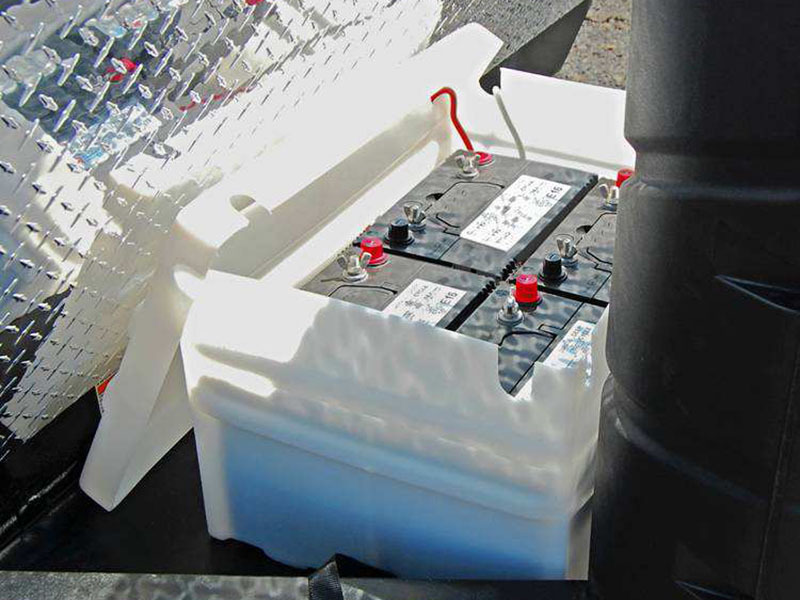 The Outdoors battery tray has a 21 13/16” width to fit a large battery, two smaller batteries or the ability to accommodate the storage of a battery and extra cargo on your A-frame. 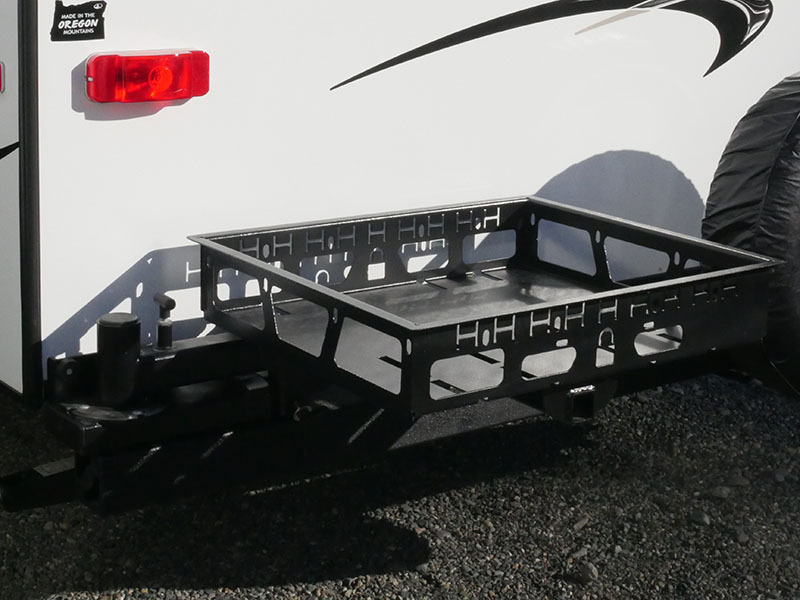 Along with the Off-Grid Battery Tray, the Off-Grid Receiver Hitch will come as standard equipment from Outdoors RV Manufacturing on the off-the-grid 2017 Black Rock trailers. This hitch is rated at 300 pounds tongue weight and 3,500 pounds towing weight so you can bring all the cargo you could need on your extra-long escape into the wilderness. This trailer hitch is specially manufactured to bolt into pre-drilled holes in the Black Rock travel trailer so the strength of the chassis is not compromised. 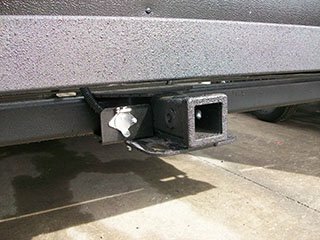 The Off-Grid Receiver Hitch will work with any 2” x 2” accessory you wish to use and can hold. 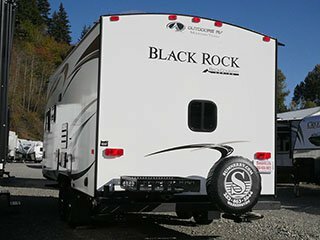 The Lock and Load SideKick designed specifically for Outdoors RV Manufacturing helps secure expensive accessories and generators to your 2017 Black Rock RV. 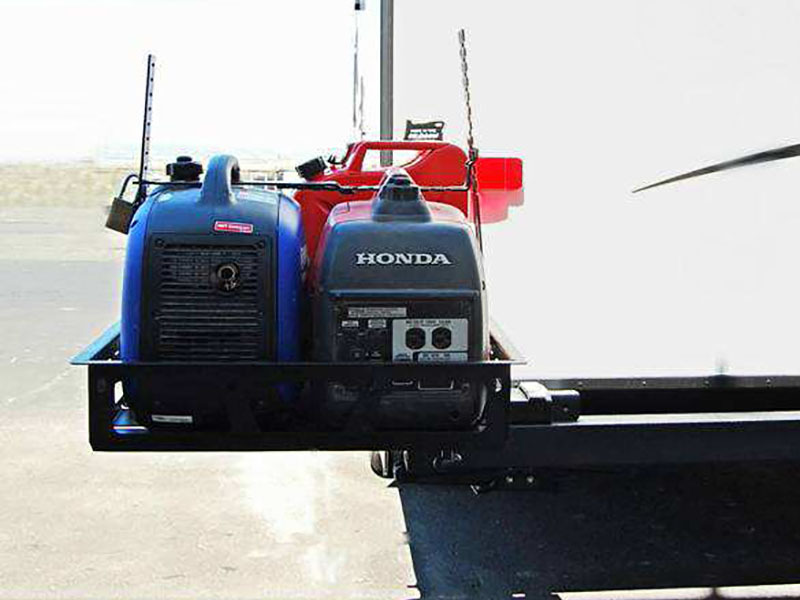 Working with the Space Dock, the SideKick generator tray incorporates tool free, adjustable security straps to fit various Honda and Yamaha generator sizes. The Outdoors RV Manufacturing Lock and Load SideKick is specially designed to work with the 2” Space Dock receiver and sit on top of the Space Dock. 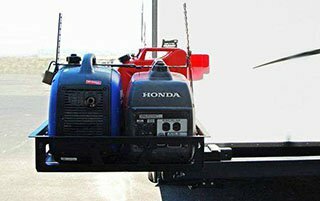 This generator tray will also come with a small extension to use with the 2” hitch receiver on the Black Rock travel trailer or any standard trailer hitch. Ultra-lightweight, the SideKick won’t make your trailer drag when you bring extra generators or cargo with you on your extended camping trips. The generator stays on the tray – even when it’s running, so you don’t have to constantly move your heavy generator when it’s not in use. The Space Dock designed specifically for Outdoors RV Manufacturing is the perfect add-on to take your extra generators or accessories with you on your Black Rock RV. Working with the Lock and Load SideKick, the Space Dock is coming from the factory already mounted on the 2017 Black Rock travel trailer from Outdoors Manufacturing. The Space Dock is manufactured with a 2” receiver, perfect for the Lock and Load SideKick or any other 2” accessory you want to bring with you. 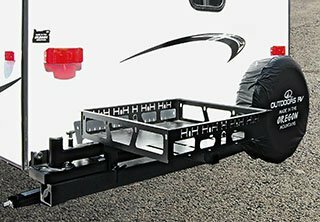 Designed specifically for the Black Rock trailer, it attaches to the bumper and is a swing arm that extends out 90 degrees and has a max capacity rating of 250 pounds tongue weight. The Space Dock is high impact powder coated to help prevent rusting and handle extreme off-roading and off-the-grid conditions so you don’t have to worry about rust. For information on ordering the Black Rock travel trailer or any of its accessories, please contact your local Outdoor RV Manufacturing dealer, which can be found at outdoorsrvmfg.com or by calling 541-624-5500.